Free music. Outdoors. Not too crowded. This is what an urban concert looks like. There is a funky band way up there. Do you know City Winery? It’s an intimate space that brings great performances to downtown Manhattan. 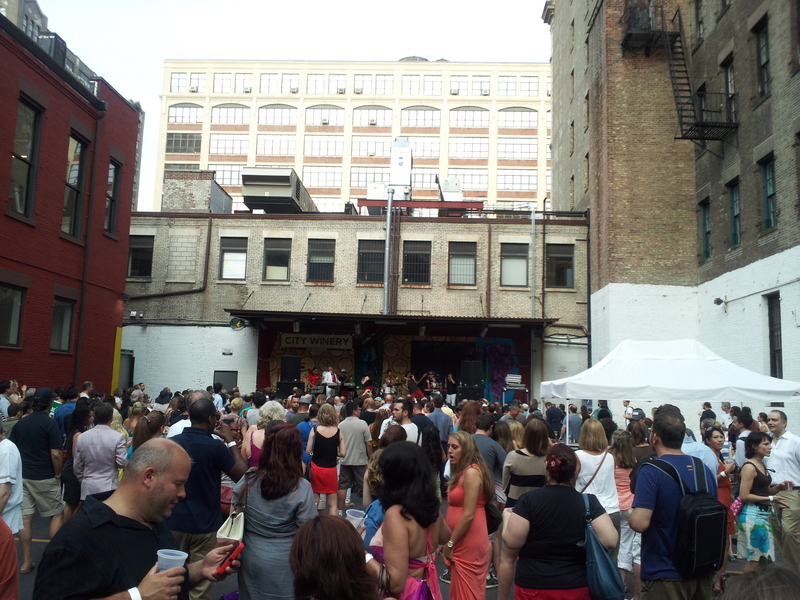 While most shows are indoors, the venue throws a tiny backyard party with live acts on Tuesday nights during the summer. And it’s free. The Hudson Square Music & Wine Festival features eclectic musicians, food vendors, and of course, vino from City Winery. From 5:30-7:30pm, chill out and have a drink or two with other people from the nabe. Even the treats are pretty cheap—$3 hot dogs, $6 beers, $7 wines. But my favorite thing is that it’s not crowded (like so many other outdoor music experiences). Check out the rest of the lineup—the party happens weekly until August 28. ← Dudes, you can finally try on Bonobos! Thanks Stephanie! Look forward to having you back!